Haha…This tittle is silly, but I love it! I also love the movie too! Have you seen this movie yet? Anyway, months ago, I had a chance to meet Nathalie and her husband Fernard at their studio in Paris. They are a team who make Hanna Bernhard jewelry; a unique, hand made, exquisite jewelry. I always love thing that is dragon. Dragons symbolize power and happiness. Yes, I ordered a dragon necklace. This is their first time to make something like this and it was a great challenge for them, they said. No surprise! 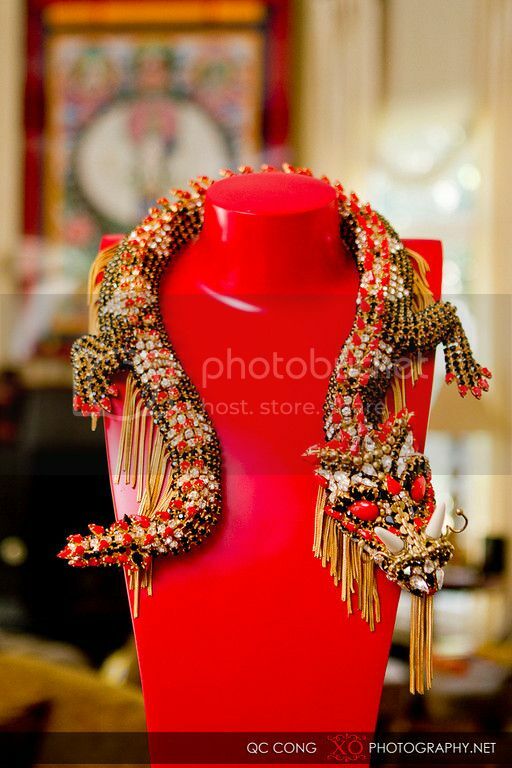 With their experience and talent, the dragon necklace is amazingly beautiful and its details are exquisite. It’s truly a statement and a mind blowing piece. I’m really happy with it. Yesterday, Dallas weather was suddenly cooler. It was a perfect time for me to style it with a vintage fur that I recently found. To give an edginess to the outfit, I paired it with The Row leggings and my gloves that I bought them in Paris at a local store long ago. Thank you QC for the photos and his wife Nancy for make-up. You’re both the best. QC, your photos are always beautiful! Check out QC website here! The necklace is STUNNING. I'm at a lost for words. I also love your vintage fur poncho. I saw one IDENTICAL to it at Neimans Last Call. Great photography, flawless makeup, and overall faboulousness! That is an amazing statement necklace indeed! The photography is flawless. HAHAHA YOUR FACE LOOK LIKE CHINESE OPERA! trying way too hard. Very nice necklace! My makeup was much heavier that day than normal, you're right. I had a new photographer and he brought someone to do my makeup, too. Maybe less foundation next time! 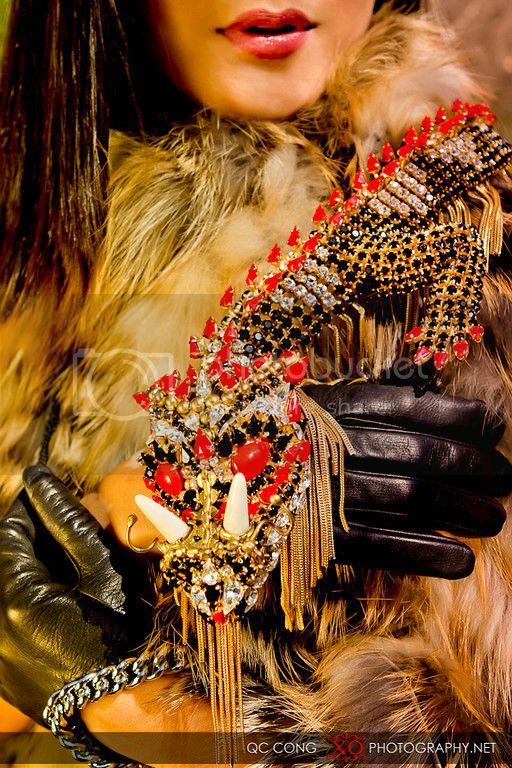 The necklace is awesome and love the beautiful fur cape. woooow. these photos are so gorgeous!!!! you're always so beautiful and you have this amazing atmosphere in your photos. I love these ones! The photos came out great! My opinion…your make-up looks flawless. I like the entire look. Ooohh what GORGEOUS pics!! I love the way you styled the fur & HB pieces! Random question, how do you keep the red on the bottom of your Louboutins? The red on the bottom of my Loubs is already wearing off, and I've only worn them 3-4 times! Got any suggestions? Thanks! To be honest, I don't know the tricks to keep the red on the bottom of the Louboutins Sorry!